Yes – things have been busy. Very busy. Exhaustion and sleeplessness have kicked in. 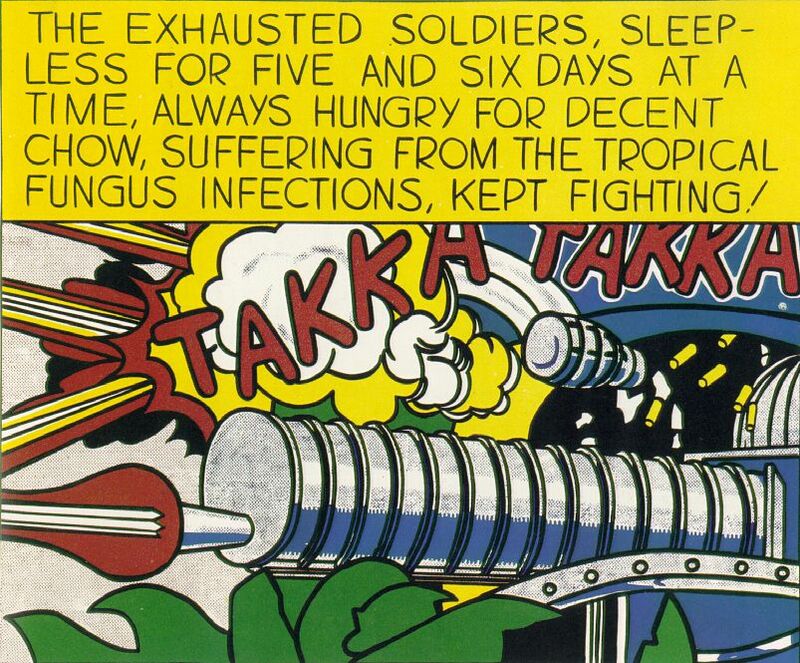 But no fungus infections as yet, I’m happy to say (note to the repulsed – I’m referencing Roy Lichtenstein at left). (Image: Roy Lichtenstein, ‘Takka Takka’, via http://www.artchive.com). On top of the symposium I’m co-convening at the University of Melbourne next week, with speeches by the Minister for the Arts, Peter Garrett, 2010 Archibald and Wynne winner Sam Leach, and other venerable members of the visual art community, I’ve also been writing an article, ‘Joining the dots: analysing the sustainability of the Australian Aboriginal art market’, for publication in UNESCO’s humanities journal, Diogenes. Yes, I know. Enough of the self-serving plugs, already. But at the moment I’m so busy I don’t have anything else for you. So here’s the pre-publication version of the paper, which looks at the sustainability of the Aboriginal art market using empirical evidence drawn from auction figures. My conclusion is that Aboriginal art, rightly or wrongly, is treated by the market as anthropological, rather than fine, art, and that this has implications for the mid- to long-term sustainability of the market. There are charts, tables and everything. Please note, it’s the pre-publication form, and will be edited and formatted differently when it appears in Diogenes. It’s also a necessarily ponderous academic piece of writing. And long. (I’m a good salesman, aren’t I?) But there are some interesting bits and pieces in there that should be useful. I hope. It’s a formal version of a paper I delivered at the 2009 Art Association of Australia and New Zealand conference, and it attracted a fair bit of interest from a number of luminaries at said event. Then again, perhaps they were just being polite. Anyways, here it is – the abstract first, to whet your appetite, and the rest of the article after the jump. Please take heed of the requisite copyright notice from Diogenes and Sage Publications. Because this is all original research put together by me and to be published exclusively in their lovely publication. And if you copy any of it and use it without requisite acknowledgment, they’ll have your proverbial guts for garters. Sotheby’s estimates between fifty and seventy percent of the Aboriginal art it sells at auction is bought by international collectors. How do those buyers view their acquistions? On the Sotheby’s website, you will not find Aboriginal art listed with ‘Australian’ and ‘Contemporary Art’ under the ‘Paintings, Drawings and Sculpture’ department. Rather, it is classified as one of the ‘Ancient and Ethnographic Arts’, alongside ‘Antiquities’ and ‘Pre-Columbian Art’. This paper will show that the promotion and perception of Aboriginal art as ethnographic rather than contemporary in nature is but one of a number of important aspects of the market that have implications for the industry’s long-term sustainability. This distinction has a significant effect on the way Aboriginal art is distributed, promoted and received by buyers and sellers. Collectors measure the value of ethnographic material by assessing its proximity to a culturally immaculate source. An object has the greatest ethnographic integrity if it emanates from a primitive, isolated community. Dr. Meaghan Wilson-Anastasios is a researcher and sessional lecturer at the University of Melbourne. Her research interests include art price formation and how and why economic superstars emerge in the auction market. Part of her research was the focus of a Four Corners program, Art for Art’s Sake, aired on ABC television. Meaghan co-authored a paper with Professor Neil de Marchi of Duke University for the Congress of the International Committee of the History of Art: ‘The impact of unscrupulous dealers on sustainability in the Australian Aboriginal desert paintings market’. She is a registered art valuer and has seventeen years’ art-industry experience in public and commercial art institutions. Postal: Department of Art History, School of Culture and Communication, University of Melbourne, Parkville, VIC 3010, Australia. Aboriginal art has attracted the attention of international curators, dealers and collectors since the mid-1990s. At the high-end of the market, much of the demand has been attributed to foreign collectors. This is unusual for the Australian art market, which is otherwise insular; most local art is acquired by domestic buyers. This worldwide interest has been encouraged by the activities of the auction house, Sotheby’s, since the launch of its stand-alone Aboriginal art auctions in 1997. The company’s marketing campaign targeted an international audience from the outset; each year a selection of key works was exhibited at Sotheby’s showrooms in New York, London, Paris and Los Angeles in advance of the annual auction. The outcomes were positive, and between 1997 and 2008 fifty to seventy percent of the value of Aboriginal art sold by Sotheby’s went to international buyers (Genocchio, 2008: 10). But how do these collectors view this art? Unlike contemporary Australian art which Sotheby’s allocates to its ‘Paintings, Drawings and Sculpture’ department, Aboriginal art is classified as one of the ‘Ancient and Ethnographic Arts’, alongside Pre-Columbian Art and Egyptian Antiquities. Sotheby’s is packaging and marketing Aboriginal art as a scientific and cultural curio, or a relic of an extinct or dying society. What does this mean for the future of the Aboriginal art market? The Aboriginal art industry underwent significant expansion in the mid-1990s. Since then, reports about the prevailing health of the market have been overwhelmingly positive. This is not surprising given that it is one of the few ‘good news’ stories to emanate from the impoverished remote Indigenous Australian communities. Art-making is the principal non-welfare source of income for many residents of these settlements. Evaluating the current and future health of the market is, therefore, a critical imperative for the future well-being of those living in remote communities. Estimates do suggest that the market in Aboriginal art has grown rapidly: in 1989, sales of Aboriginal art were estimated to be worth $18.5 million (Altman, 1989); by 1997, this amount grew to $60 million (Australian Parliament, 2007: 2.7); and in 2002, the Aboriginal art and craft market generated approximately $200 million in sales (Myer, 2002): 165. But an alternate view of the depth and resilience of the market emerges when data drawn from the auction record is examined in detail. Further, a comparison of the market’s structure highlights a number of significant points of difference between the way Aboriginal and non-Aboriginal contemporary art is distributed and promoted; this paper will show that these distinctions have important implications for the mid- to long-term sustainability of the Aboriginal art industry. Ethnographic art is made by small-scale, traditional societies that are isolated, politically and economically, from large, generally western civilizations (Dutton, 1993). Collectors judge an object as having the greatest ethnographic integrity if it has been produced using traditional techniques and materials, and used intensively as part of daily life or religious ritual; as described by Rudolf Arnheim: ‘primitive images… do spring neither from detached curiosity about the appearance of the world nor from the “creative” response for its own sake. They are not made to produce pleasurable illusions. Primitive art is a practical instrument for the important business of daily life.’ (1974: 146). So, for example, a Sepik shield pierced with arrowheads acquired via mortal combat would be highly valued by collectors of ethnography. On the other hand, an object made for the tourist market has little intrinsic ethnographic value. There has been much debate about whether it is an example of ethnocentric bias to present art from non-Western cultures in this manner. (Abusabib, 1995; Arnheim, 1974; Danto, 1988; Dutton, 1993; Shiner, 1994). However, collectors and curators who manage ethnographic collections do place a premium on objects made in a traditional style; the greater the distance between an ethnographic relic and the developed world, the better. Underpinning the study and collection of ethnographic artefacts is the romantic notion of the ‘noble savage’, a concept built upon Jean-Jacques Rousseau’s social theory that human beings in a natural state are inherently good; civilisation is a corrupting influence that erodes the instinctive human tendency towards spontaneity, sentiment, liberty and truth: ‘Man is born free; and everywhere he is in chains.’ (Rousseau, 1968: 1.1). Students and collectors of ethnography seek to understand humans who live outside the ‘civilised’ world through their artefacts in the belief that it can offer insight into a less corrupt existence. The legacy of this romantic patrimony pervades the ethnographic art market and influences the way Aboriginal art is valued and perceived. Whether Aboriginal art is best defined as ethnographic or contemporary is an ideological debate that falls outside the scope of this paper. Either way, it seems that within the market Aboriginal art is packaged and transmitted as if it were ethnographic material. In this context, the difference between ethnographic and contemporary art can be condensed to a single point of comparison: ethnographic art is made by a ‘people’; contemporary art is made by a ‘person’. Collectors of ethnographic art seek out objects that embody the cultural and spiritual world-view of a discrete and culturally isolated population; collectors of contemporary art choose an artwork because it represents the realisation of a single person’s creative vision. This distinction is reflected in the way the art is sold. Descriptions of ethnographic art in auction catalogues give detailed information about the physical attributes and provenance of objects but, more often than not, say little if anything about the maker. By contrast, in the contemporary art market the name of the artist means everything. For ethnographic art collectors, the individual is subsumed by the culture, and the identity of the maker is far less important than the object’s importance to and function within the society that made it. This is reflected in the manner in which ethnographic art is presented to buyers; for example, the ‘Ethnographic and Ancient Art’ auction highlights page on the Sotheby’s website features the following objects: a ‘magnificent’ Tsimshian polychromed wood face mask, and a ‘rare and important’ Fang Reliquary Guardian Head from Africa’s Betsi region. Neither are attributed to a named artist, and dates given are approximate. The inclusion of terms such as ‘magnificent’ and ‘important’ in the item description is a convention borrowed from the jewellery and decorative arts market; such terms are never included in the object summaries for fine art. This pattern is replicated on the page dedicated to Aboriginal art which features three wooden artefacts, a late nineteenth century drawing, and a 1972 Papunya board. Only two of the six items shown are attributed to an artist by name. If we entertain the thought that the art market measures the value of Aboriginal art according to ethnographic measures of quality, it helps explain why Aboriginal artists so often seem to confront double standards when it comes to questions of authenticity compared with their non-Indigenous peers. Because the most sought-after ethnographic art emerges from a culturally immaculate source, workshop practices that are commonplace in the contemporary art world are anathema to collectors of ethnography. If ‘authenticity’ is measured by an artwork’s proximity to a privileged initiate, or owner of a story, the hand of another in its production will detract from its value. Therefore, Aboriginal artist Turkey Tolsen Tjupurrula’s methods of production were deemed highly problematic in the 2007 Australian Government Senate Report into the Aboriginal art market: “I do the markings first and give the canvasses to the women to complete… They make them, I sign them.” (Australian Parliament, 2007). When an artwork is attributed to an Aboriginal artist, assumed to be the owner of the story depicted, the involvement of assistants detracts from its ethnographic authenticity and value. Yet in western art apprentices, assistants and expert technicians are commonly employed by artists to boost production levels and utilise specialist finishes and effects. Henry Moore had little hands-on involvement in the production of many of his large sculptures, instead giving maquettes to his apprentices to build to scale; Rodin employed an expert foundry to cast his bronzes; the most intricate parts of Bernini’s Apollo and Daphne were carved by a specialist; and Anselm Reyle uses colour swatches to direct assistants in the production of his stripe paintings. Yet no one questions the authenticity of these artworks when only one name – that of the artist – appears on museum labels or in auction catalogues. Another double standard applies to how the relationship between art advisors and artists is perceived. In the non-Aboriginal contemporary art sector, it is accepted that the most successful art dealers advise their artists of ways and means to adapt their work to maximise their earning capacity. For example, Christopher Heathcote described how dealers Anne and Tam Purves of Australian Galleries encouraged artists such as Arthur Boyd and Sidney Nolan to produce discrete ‘series’ of paintings in the 1960s as a marketing strategy to make new work more appealing to collectors (Heathcote, 1995). Dealers encourage their artists to produce work that fits a range of price-points, from the most expensive, large-scale artworks destined for public institutions, to affordable prints or drawings. They also help artists find ways to generate more income from their practice; for example, video, installation and performance artists can produce signed, limited-edition stills and DVDs, or sell relics from their performances; and painters whose output of original paintings is restricted can generate more income by collaborating with a printmaker to issue limited-edition screenprints (Velthuis, 2005; Caves, 2000; de Coppet & Jones, 1984). Similar interventions by dealers and art centre staff are identified as problematic in the Aboriginal art market. For example, the 1998 ABC documentary, Art From the Heart, drew attention to what was deemed the unacceptable practice of art centre workers making recommendations to Aboriginal artists about the physical attributes of their work in response to market demands (Moore, 1999). It is well documented that art centre advisors offer advice to Aboriginal artists to help make their art more saleable, a practice that dates from the earliest days of the modern Aboriginal art movement. At the birthplace of the Western Desert art movement in Papunya Tula, and in Emily Kame Kngwarreye’s homeland at Utopia, the sacred, secret imagery artists depicted was censored for a uninitiated audience, and artworks were made expressly and exclusively for the consumption of the western art market (Bardon, 1991  ; Genocchio, 2008; Batty, 2009). But practices that are commonplace in the contemporary art world are condemned in the Aboriginal market because Aboriginal art is judged according to ethnographic standards – the intrusion of market forces into the process of creation is seen as undermining an object’s cultural integrity. There is no question that a number of Aboriginal artists have achieved significant levels of fame and material success. Emily Kame Kngwarreye, Clifford Possum Tjapaltjarri, and Rover Thomas amongst others have become superstars in the economic sense of the word; they are responsible for generating the lion’s share of revenue in the marketplace (Rosen, 1981; De Vany, 2004). But although the superstar phenomenon is common to the art auction market in general, it is amplified in the Aboriginal art sector. This indicates that demand for the small number of artists at the top of the market is exaggerated relative to the market in general. Figure 1 shows that between 1993 and 2008, sales of art by the twelve highest-selling Aboriginal artists accounted for almost fifty percent of the total amount of Aboriginal art sold at auction. If we expand these figures to include the seventeen top-selling artists, we find that between them they generated sixty-six percent of auction sales of Aboriginal art between 1997 and 2008 (Francis, 2006) compared with the seventeen top-selling non-Aboriginal Australian contemporary artists who were responsible for thirty-two percent of sales in their sector (De Marchi & Meaghan Wilson-Anastasios, 2009). 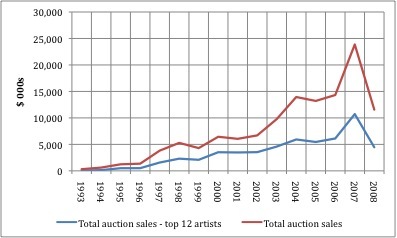 Figure 1: Total auction sales: overall Aboriginal art auction market, and the top-selling twelve Aboriginal artists. (Artists: Kngwarreye, Emily; Thomas, Rover; Tjapaltjarri, Clifford Possum ; Tjupurrula, Johnny Warangkula; Tjapaltjarri, Mick Namarari; Napangardi, Dorothy Robinson; Nakarra, Queenie McKenzie; Tjampitjinpa, Kaapa; Tjupurrula, Turkey Tolson; Tjapaltjarri, Tim Leura; Tjampitjinpa, Ronnie; Tjungurrayi, Shorty). We will soon witness in some areas of the country the death of the last custodians of traditional songs, ceremonies and dances. As a result artwork that we currently revere today will be produced in a different form and with different cultural integrity. It will, I suspect, be all the greatly diminished as artwork and as a record of culture. (Australian Parliament, 2007: Submission 78). Marketing the first generation of Aboriginal desert painters as the genuine ethnographic article has the corollary effect of initiating a spiral of redundancy that makes it increasingly difficult to promote subsequent generations of Aboriginal artists. We can find evidence of this in empirical data drawn from the auction record. Auction figures are an important gauge for measuring the health of the art market as they capture levels of demand in the secondary, or resale, market. Without a viable resale market, the expansion of an artist’s primary commercial market is restricted, as there is no means of reselling works of art acquired at primary outlets such as galleries and, in the case of the Aboriginal market, art centres. Collectors are less likely to spend significant amounts of money on an artist’s work if he or she does not have an established auction market, as there is no way of realising their investment in the future. A close analysis of the auction figures relating to the trade in Aboriginal art tells us a great deal about the shape of the market, and enables us to formulate some predictions about the industry’s sustainability. Figure 2 compares the relative ages of artists in the non-Indigenous contemporary Australian and the Aboriginal art auction markets. 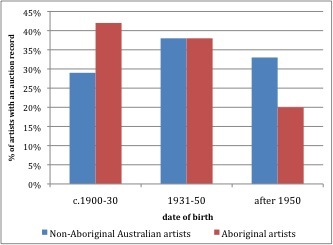 The proportion of artists in the contemporary sector born after 1950 is 33%, compared with 20% of the Aboriginal artists; the figures are reversed at the other end of the scale, with 42% of the Aboriginal artists in the survey born between 1900 and 1930, compared with 29% of the non-Indigenous Australian artists. This is what we would expect to see if there was much higher demand for works of art by the earliest generation of Aboriginal artists and reduced demand for work by emerging painters. Figure 2: Birth dates of Australian artists with an auction record (Calculated from information derived from Australian Art Sales Digest. ‘Auction record’ includes artists who have registered one or more works of art offered for sale at auction, whether or not they sold. Numbers of artists: Aboriginal: 681; Non-Aboriginal Australian: 2781). The artists and their art are seen as less authentic the further they travel from a semi-mythical spiritual and physical point of genesis. Because the value of ethnographic art is measured by the maker’s distance from developed society, the art market itself becomes an instrument of redundancy when trade is initiated with a remote settlement. Cultural isolation becomes impossible as dealers, curators and collectors begin to engage with Aboriginal communities. Even as they take an active part in this very process, critics and commentators decry what they characterise as the corruption of Aboriginal art by market forces; for example, critic Ashley Crawford commented on a commercial exhibition by the Ramingining artists, saying: ‘They seem to have a strong cultural base so have not been knocked off their feet by the art market fashions… Traditional cultural life is still their muse’ (Genocchio, 2008: 178). One of the outcomes of this is that even within the body of work produced by the best-selling Aboriginal artists, there is a marked discrepancy between levels of demand for the earliest paintings, and later work which is dismissed as being too commercial. In the non-Aboriginal Australian art market the depth of demand means that even poor-quality artworks by popular artists will find a buyer at the right price. But in the Aboriginal market, as the supply of major works by the best-selling painters has disappeared, the quality of work circulating on the auction market has diminished, and there is little demand for these paintings. This can be demonstrated empirically. Clearance rates, which express the number of works sold relative to the number offered for sale as a percentage, are an accurate way of measuring levels of demand within the auction market. Figure 3 shows that the clearance rates in the Aboriginal art auction market for work by the best-selling artists has been declining steadily since 1995, from a peak of 82% to a low of 46% in 2008. By comparison, the average clearance rate for the best-selling non-Aboriginal contemporary artists between 1998 and 2008 was 75% (Wilson-Anastasios, 2009). These figures are reinforced by the summary in table 1, which compares the individual clearance rates for the twelve highest-selling artists at auction in the Aboriginal and the contemporary Australian market. The rates for the Aboriginal artists are far lower than their non-Aboriginal peers; this suggests there is a ceiling on demand for Aboriginal art. It may also indicate a lack of confidence in the market attributable to the impact of the activities of unscrupulous dealers in the Aboriginal art market, and problems with attribution and authenticity that arose during this period (De Marchi & Meaghan Wilson-Anastasios, 2009). Figure 3: Average annual percentage of artworks sold at auction by the twelve best-selling Aboriginal artists, 1993-2008. (Artists: Kngwarreye, Emily; Thomas, Rover; Tjapaltjarri, Clifford Possum ; Tjupurrula, Johnny Warangkula; Tjapaltjarri, Mick Namarari; Napangardi, Dorothy Robinson; Nakarra, Queenie McKenzie; Tjampitjinpa, Kaapa; Tjupurrula, Turkey Tolson; Tjapaltjarri, Tim Leura; Tjampitjinpa, Ronnie; Tjungurrayi, Shorty). 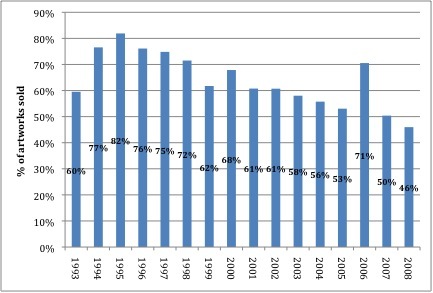 Table 1: Average auction clearance rates 1993-2008. When the declining clearance rates are considered in light of the sales figures presented in figure 1, it shows that during this period of time, buyers were competing more aggressively for an ever-decreasing number of significant paintings by the most senior Aboriginal artists. Between 1998 and 2008 a total of about 250 works by these artists appeared at auction annually; although the number of works offered for sale remained constant, as shown in figure 3 clearance rates dropped steadily each year. And yet over the same period, the total revenue generated at auction by these artists has increased. This means that each year there has been less demand for the work on offer, and that competition amongst buyers has focused on the paintings at the top of the market; more revenue has been generated, but fewer artworks have been sold each year. The declining clearance rates for the best-selling artists would be less of a concern if we found evidence of demand for work by a new generation of Aboriginal artists. But unlike the contemporary sector, where there is a well-established body of emerging and mid-career artists who occupy the middle ground of the auction market (Wilson-Anastasios, 2009), figure 2 shows that this has not evolved to the same extent in the Aboriginal art market. Collectors are competing for the works with the greatest ethnographic integrity, but they have little interest in work by emerging artists. In contrast, the contemporary art market is under a process of constant regeneration. As the supply of work by the most senior contemporary artists diminishes, a new group of superstars fill the void. This is no accident; it occurs, for the most part, as a result of the activities of art dealers (de Coppet & Jones, 1984; White & White, 1965; Secrest, 2004; Caves, 2000; Diamonstein, 1994). In the Australian market, the single most important factor that predicates an artist’s professional and commercial success is the involvement of an influential dealer in their career (Wilson-Anastasios, 2009). Art market superstars evolve from the joint venture that is the professional relationship between dealer and artist. This crucial first-tier in the retail distribution chain is not a simple economic exchange, with the artist as producer and the dealer as retailer. Both parties expend individual efforts towards attaining professional and commercial success. In the most effective models, the relationship between a contemporary artist and his or her dealer is close and complex (Caves, 2000). Dealers take informed risks with emerging artists and subsidise their exhibitions with earnings from their top artists (Velthuis, 2005). They do so to establish a future generation of superstars. The reason there is a healthy number of mid- and early- career non-Aboriginal Australian contemporary artists establishing a commercial profile is that influential dealers invest time and money promoting their careers. Dealers act as the intermediary between the artist and the market. The major urban commercial dealers have the benefit of time, resources, contacts and close geographic and social proximity to wealthy collectors and influential tastemakers to whom the new superstars are promoted. Collectors who are willing to spend large sums of money acquiring art objects generally expect that the art they buy will represent a good investment. But expensive art does not speak for itself. It has to be ‘sold’. Collectors expect to see an artist’s work and career locked into a trajectory that holds the promise of positive future development. The most successful dealers promote their artists’ best interests and help them secure the kind of career markers that will draw the attention of these serious collectors (Velthuis, 2005; Caves, 2000; de Coppet & Jones, 1984; Diamonstein, 1994). By contrast, in the Aboriginal market art centres most commonly occupy the first-tier in the distribution chain. These institutions perform a multifaceted and valuable function within remote communities. Often run as co-operatives owned by the Indigenous residents of the settlements, art centres are generally managed by non-Aboriginal arts workers with expertise in art production. Most of the centres provide facilities and materials for any members of the community who wish to make art; the art centre workers then process, record and store the artworks, and negotiate sales transactions with dealers, collectors and curators. On this evidence, art centres are, in effect, compensating for failings in government policy and service delivery to remote communities, and from a social perspective, it is difficult to overstate their importance to the people who use them. But it is not surprising that one of the greatest difficulties facing these institutions is staff turnover. The centres are poorly funded, and understaffed. In its submission to the Senate Enquiry, the organisation Desart, which represents forty-three art centres, noted that $7 million of its total annual sales of $12 million came from the two centres at Papunya Tula and Balgo. Its forty-one other centres shared $5 million, an average of just $122,000 each. Running an art business on this turnover would be difficult under the best of circumstances. But the responsibilities assumed by the art centres fall way outside normal commercial art gallery functions; to expect them all to turn a profit and to develop an artist’s critical and commercial profile as effectively as an urban-based art dealer under such pressure is setting a Sisyphean task. For the art centres to remain financially sustainable, the social functions they perform and the art business would ideally be independent of each other. Most centres only receive small grants from government arts funding bodies to support their art activities. Arts funding at this level rarely supports infrastructure investment and although funding for capital items such as cars, buildings and other facilities can be accessed through government community welfare bodies, anecdotal evidence suggests that few of the centres apply for support to subsidise the social and welfare activities they undertake. If the art centres sought funding for their welfare-based activities and were less reliant upon income generated by art sales, staff could relinquish some of their control over direct sales, instead acting as mediators to encourage the establishment of more direct formal and personal relationships between urban-based art dealers and artists. If dealers had more control over the artists’ output, it might reduce levels of risk sufficiently to encourage them to invest in the promotion of new Aboriginal artists, and provide an incentive for them to apply the same proven methods of market development they use in the contemporary art sector. And this would have positive economic outcomes for the artists and their communities. As observed by dealer William Mora, who sells both Aboriginal and non-Indigenous contemporary Australian art: ‘There seems to be a price ceiling for collectors of Aboriginal art, but once you break into the more general contemporary art market the sky is the limit on prices – contemporary art buyers are willing to pay a lot more for good work’ (Genocchio, 2008: 177). As it stands, dealers in Indigenous art have to contend with extremely high levels of risk and upfront costs compared with their peers in the contemporary art sector. For example; they buy materials for artists; in many cases dealers buy work outright and often sight-unseen and regardless of quality; they commonly pay all transport costs which, given the great distances between Australia’s urban centres and the remote communities, can be significant; dealers in the Aboriginal art market also often cover exhibition costs such as stretching canvases, printing marketing materials, postage and photography – costs that in the contemporary market are most commonly allocated to the artist. The tyranny of distance and the art centre system means there are many more intermediaries between the dealer and the artist than in the contemporary sector. There are more opportunities for something to go wrong between the point of production and delivery of the work to the dealer, including the intervention of unscrupulous agents whose activities can impact adversely upon the quality and quantity of work released onto the market (De Marchi & Wilson-Anastasios, 2009). But it also makes it difficult to develop the type of close, co-operative relationship characterised by the most successful artist/dealer partnerships in the contemporary art market. The lack of direct input into the production and first-tier of distribution makes it difficult for dealers to moderate supply and demand as they do in the non-Indigenous marketplace. It also means they are unable to monitor prices and exert control over the quality of art that enters the market. From the dealers’ perspective, if they can moderate an artist’s prices and profile, the development of the artist’s career is a worthwhile investment of time and money (Wilson-Anastasios, 2009). To secure the future of the Aboriginal art market, it needs to expand and evolve so that a new generation of artists is cultivated and they are accepted as contemporary practitioners. The market agents best qualified to do this are art dealers. The urgency of this challenge is highlighted by figures from the auction record. While the total dollar value of Aboriginal art sold at auction between 1997 and 2008 increased significantly, which is what we would expect to see during a major art market boom, the value of the other Australian auction market sectors rose at a commensurate rate (figure 4). The chart shows that although sales of Aboriginal art jumped suddenly in 1997 with the commencement of Sotheby’s Aboriginal art auctions, since then, when viewed as a proportion of the entire Australian auction market Aboriginal art sales have remained unchanged for the last decade. 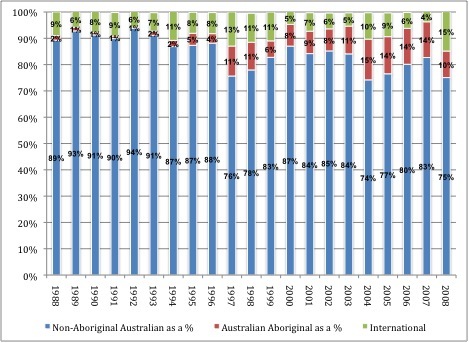 Figure 4: Proportion of total annual auction sales (%): Non-Aboriginal Australian artists; Aboriginal artists; and International artists. Until fundamental changes are made to the way Aboriginal art is marketed and distributed, there are few incentives for dealers to expose themselves to the risks involved in promoting emerging Aboriginal artists. Dealers in Aboriginal art compensate for this by marketing and packaging their artists differently from their peers in the contemporary sector. 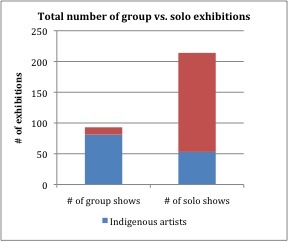 Figure 5 compares the number of solo and group shows staged by a sample group of major Aboriginal and non-Aboriginal contemporary galleries in Melbourne, Sydney and Perth over a two-year period. It shows what we would expect to see if Aboriginal art dealers were dispersing risk by staging group shows, rather than investing everything in a single artist. This poses a problem for emerging Aboriginal artists because significant solo exhibitions are the most effective way to promote an artist’s profile and attract the attention of the important collectors and tastemakers whose endorsement generates critical and commercial success (Wilson-Anastasios, 2009). Without this, paintings tend to fall into a decorative art category in terms of value and demand. Figure 5: Total number of solo and group exhibitions, comparing dealers in Indigenous art with dealers in non-Indigenous Australian contemporary art. This is a crucial point for future policy development. The figures discussed earlier signal a significant risk to the long-term financial prospects of many of the art centres. Their survival is contingent upon several mutable elements. All of the most successful senior artists upon whom many of the centres rely for the lion’s share of their income are elderly. Without promoting a new generation of artists to replace them, the lost income will not be subsidised by new earnings. Also, although the much anticipated resale royalty legislation brought into effect in June 2010 has been promoted as an effective means of subsidising Aboriginal artists’ earnings, it will have limited efficacy. During the boom between 1998 and 2008, the top twelve-selling Aboriginal artists in the auction market were responsible for generating an average of $5 million in sales per annum, or about fifty percent of the market sector. On a resale royalty of five percent, less the ten percent fee charged by the collection agency, this will generate $225,000 each year in royalties, or $18,750 per artist. But this is only for the dominant twelve artists. If the remaining $6 million each year is divided equally between the 110 art centres around Australia, it will amount to $270,000 in fees, giving each centre approximately $2,500. This is the best-case scenario, as the figures were generated during the boom, and it does not take into account the market dominance of artists from the biggest centres, such as Papunya Tula. Given the scale of the Aboriginal art market, it is unlikely that it will disappear, but the question is what form it will take and whether the outcome will benefit artists and their communities. The focus on the ethnographic qualities of Aboriginal art that has dominated the market to date means that without some fundamental changes in the way it is bought, sold, packaged and promoted, there is a risk that the market will be split in two. Paintings by long-dead artists that dominate the very top end of the auction sector will continue to circulate as collectors compete for the best work and drive prices up, but there will be little or no transition of new artists’ work into the secondary market. Although the resale royalty will direct some of the funds circulating in the auction market back to the families of the superstars, it will have little impact on the wellbeing of the great majority of Aboriginal artists. At the other end of the scale, it is likely that there will continue to be demand for low-priced paintings to feed the tourist and decorative art market, although this type of work never makes the transition to the fine art market, and there is a ceiling on the amount of revenue it can generate. But if a way can be found to promote Aboriginal art’s contemporary aspects rather than focusing on its ethnographic qualities, artists will no longer be expected to remain in a state of social and cultural stasis and the market will embrace future generations of superstars, so supporting the creation of new and exciting work. Abusabib, M. A. (1995) African art: an aesthetic inquiry. Uppsala: Uppsala University. Altman, J. (1989) Review of the Aboriginal Arts and Crafts Industry. Canberra: Commonwealth of Australia. Arnheim, R. (1974) Art and Visual Perception: A Psychology of the Creative Eye (Expanded and revised edition ed.) Berkeley: University of California Press. Australian Parliament (2007) Indigenous art – securing the future: Australia’s Indigenous visual arts and craft sector. Canberra: Department for the Environment, Communications, Information Technology and the Arts. Bardon, G. (1991 ) Papunya Tula: art of the western desert. Melbourne: J.B. Books. Batty, P. (2009) The art of the art advisor: Rodney Gooch and the invention of Aboriginal art at Utopia. Art Monthly Australia, 221: 22-26. Caves, R. (2000) Creative industries: contracts between art and commerce. Cambridge, Massachusetts: Harvard University Press. Danto, A. C. (1988) ‘Artifact and Art’, in S. Vogel (ed. ), ART/Artifact: African art in anthropology collections, p. 18-32. New York: Center for African Art. de Coppet, L., & Jones, A. (Eds.) (1984) The art dealers. New York: Clarkson N. Potter. De Marchi, N., and Wilson-Anastasios, M. (2009) ‘The impact of unscrupulous dealers on sustainability in the Aboriginal desert paintings market: A view from the high end’, in J. Anderson (ed. ), Proceedings: 32nd Congress of the International Committee of the History of Art, p. 986-990. Melbourne: Melbourne University Press. Diamonstein, B. (1994) Inside the art world: Conversations with Barbaralee Diamonstein. New York: Rizzoli. Dutton, D. (1993) ‘Tribal Art and Artifact’, Journal of Aesthetics and Art Criticism, 51: 13-21. Francis, K. (2006) A superstar dreaming: an economic analysis of the Aboriginal Desert paintings market. Duke University. Genocchio, B. (2008) Dollar dreaming: inside the Aboriginal art world. Prahran: Hardie Grant Books. Heathcote, C. (1995) A quiet revolution: the rise of Australian art 1946-1968. Melbourne: Australian Print Group. Moore, R. (Writer) (1999) Art from the heart, J. Eccles (Producer). Australia: ABC-TV. Myer, R. (2002) Report of the contemporary visual arts and craft inquiry. Canberra: Australian Government, Department of Communications, Information Technology and the Arts. Rosen, S. (1981) ‘The economics of superstars’, American Economic Review, 71: 845-858. Rousseau, J.-J. (1968) The social contract (M. Cranston, Trans.). London: Penguin. Secrest, M. (2004) Duveen: a life in art. New York: Knopf. Shiner, L. (1994) ”Primitive Fakes’, ‘Tourist Art’, and the Ideology of Authenticity’, Journal of Aesthetics and Art Criticism, 52 (Spring): 225-234. Velthuis, O. (2005) Talking prices: Symbolic meanings of prices on the market for contemporary art. Princeton: Princeton University Press. White, H. C., & White, C. A. (1965) Canvases and careers: Institutional change in the French painting world (2nd (1993) ed.). Chicago and London: University of Chicago Press. Wilson-Anastasios, M. (2009) Art at auction: price formation and the creation of superstars in the Australian art auction market. Melbourne: University of Melbourne. I am surprised you did not read my PhD thesis. It would give you more insight into art centres and their marketing innovations. Title is A fragile Thing: Marketing of Aboriginal Art from Remote area Communities. I look forward to hearing the paper tomorrow. Hi Jacky – thank you so much for your feedback. Now that teaching is over for the semester, I’ll be sure to have a look at your PhD. I’m always keen to read more about the area. Interesting piece. Touches on some key issues, esp, in terms of representation at a dealer level. Another area you might not have given much thought to is that the Indigenous market entirely lacks a number of the important, self-sustaining, self-generated strategies of the contemporary market…. As you would know the arts community is almost always engaged in processes of exhibition, debate, collaboration, discussion well before dealer galleries become involved in individual careers. Initiatives like artist-run-galleries, curated exhibitions, shared studios etc all form a process which drives the production of contemporary art at a grassroots level and in a sense performs an important ‘editing’ function before dealers become involved. (That’s not to say they don’t take risks in choosing to support individuals though). Participation in this level of the arts is of primary concern for many contemporary artists, especially those we see eventually supported by the more respected commercial contemporary galleries, and can be seen as an important context for sustaining ‘production’. Indigenous work, while motivated by a love of culture and often by concerns regarding generational succession, exists in an entirely different cultural (and especially economic) context. So, you could say that this kind of discrepancy at a grassroots level has led to a number of the self-generating, sustaining, community driven practices which support contemporary art to not always be replicated, or replaced by similar cultural equivalents, in an indigenous context. I agree that the emphasis on culture, elderly practitioners, the economic successes of the market etc have all impacted on sustainability. And also that the complex internal/external dialogues between culture and the art-market have maybe over-looked opportunities to really build sustainability by looking more critically at the ways in which work is produced (and represented) esp. in terms of its claims to being contemporary. You are right too in saying that art centres, dealers and funding bodies all need to address these issues in real terms. Hi Quentin – you’re absolutely correct – in formulating my paper, I hadn’t considered the comparison between the way the contemporary urban art industry operates via its pre-commercial market stages in the development of an artist’s career vs. the mechanisms that drive the Aboriginal art industry in the earliest stages of career development. Of course, the factors you identify continue to play an important role for most contemporary artists, even after they have secured commercial representation/success. I’ve discussed your ideas with a number of my academic and professional colleagues since reading your comment, and I think you’ve really hit on something there! Thank you so much for what is a very interesting and thought-provoking insight. An excellent insight, thanks Meaghan; erudite and comprehensive. I spent several weeks as a volunteer at the Arts Centre in Yuendumu last year, so I had the opportunity to experience both the challenges and the rewards of a well run centre, up close and personal. I enjoyed the experience tremendously but have often reflected on the questions which you have enunciated so clearly here. Well done.